Scheffer Elementary’s old school bell is in front of Scheffer Recreation Center, 237 Thomas Avenue. The recreation center’s ball fields include the site of the city’s first playground, Como Playground, established in 1903. A plaque can be found at the playground site. 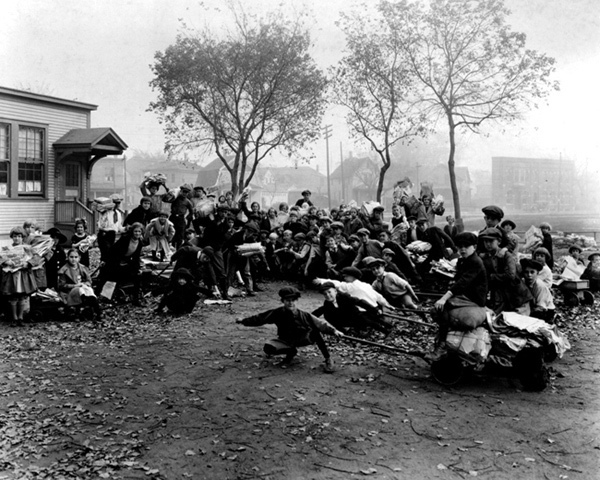 Before Como Playground, named for adjacent Como Avenue, the city’s parks were typically public squares and not active places for children. 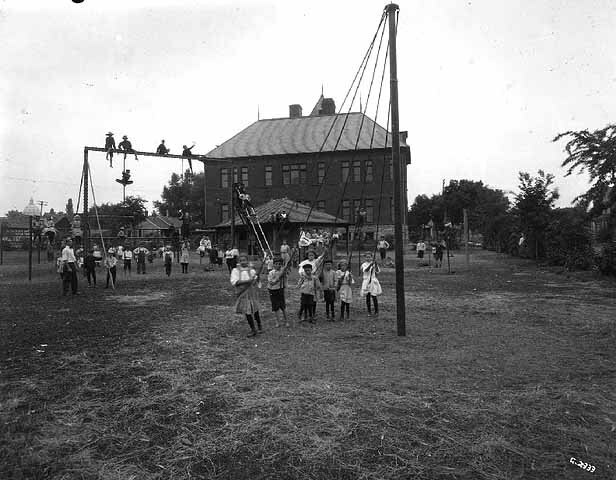 Como Playground was part of the play area for Scheffer School. It had play equipment, including swings, and a small shed-like shelter. Scheffer School was a square brick building with a stone foundation. Its prominent bell tower had a peaked roof. The bell tower was above a grand arched entrance. A large and beautiful window above the entrance lit the front staircase. 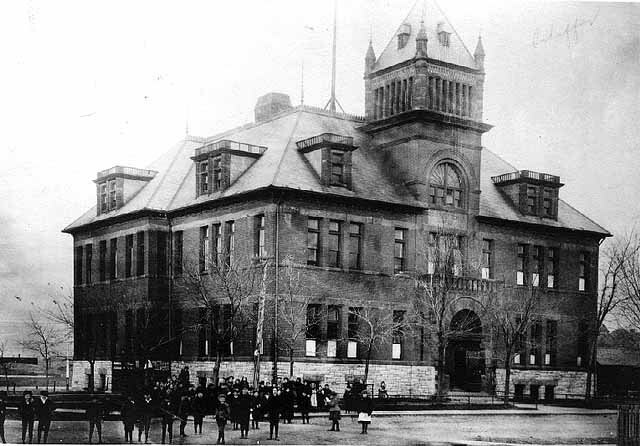 Scheffer School was 2 ½ stories tall, with dormers on its uppermost floor. It was built at the turn of the 19th and 20 centuries and like many schools of its day, was built without a gym. Some long-ago students remember the basement being used for active play, but children usually were outdoors on the school’s large fields. The school was named after Albert Scheffer (1844-1905). Scheffer was a banker, state senator and longtime school board member. Scheffer Avenue is also named in his honor. Scheffer was always a neighborhood school and drew its students from the surrounding community. It was always very ethnically diverse and students were from working-class families. Students were active in the surrounding community. One series of photos shows pupils holding a large paper drive. Memories of the school include stories of teachers riding the Como streetcar to school. 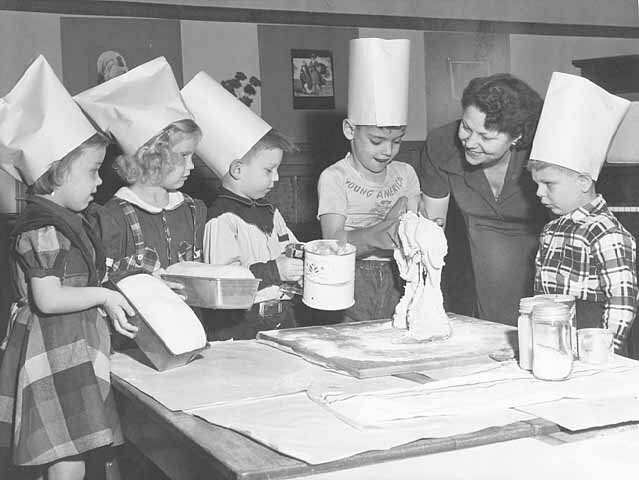 One woman principal in the early 20th century was known by teachers as one of the “seven devils,” the nickname for a strict group of administrators. 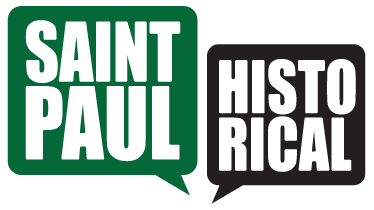 One Scheffer alumnus is Saint Paul School Board Member John Brodrick. When enrollment climbed in the mid-20th century Scheffer had portable classrooms. But its final years the school became run-down. The peak on its once-splendid tower was removed due to its deteriorated condition. By the early 1970s it was closed due to declining enrollment and the condition of its building. It was torn down in 1974 and replaced a few years later with Scheffer Recreation Center. 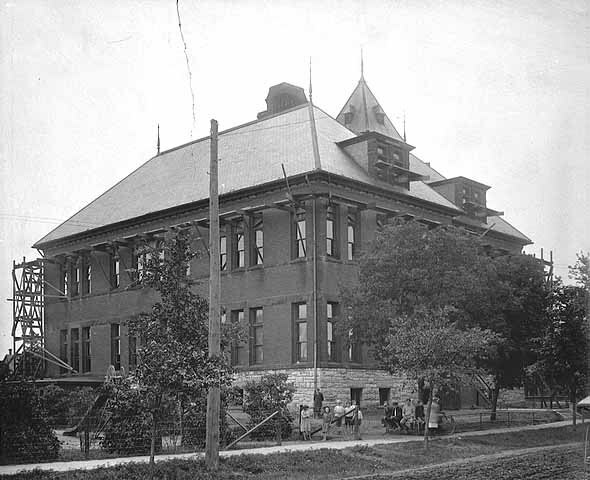 Jane McClure, “Scheffer Elementary,” Saint Paul Historical, accessed April 19, 2019, https://saintpaulhistorical.com/items/show/66.